In six months, this could be most famous custom Harley-Davidson Softail in the world. 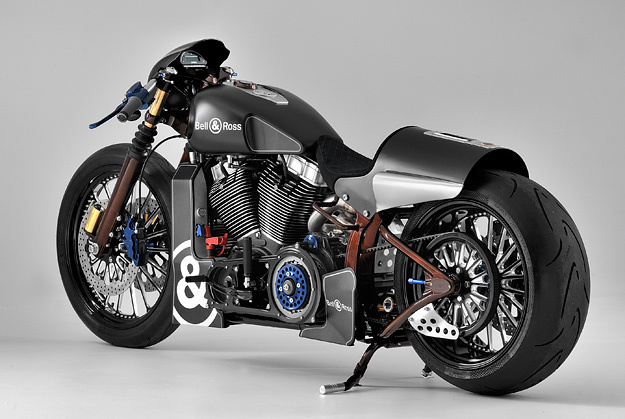 It’s yet another winner built by the English workshop Shaw Speed & Custom, and this one has a very defined target: to defend SS&C’s world championship title at the AMD event in Sturgis in August. 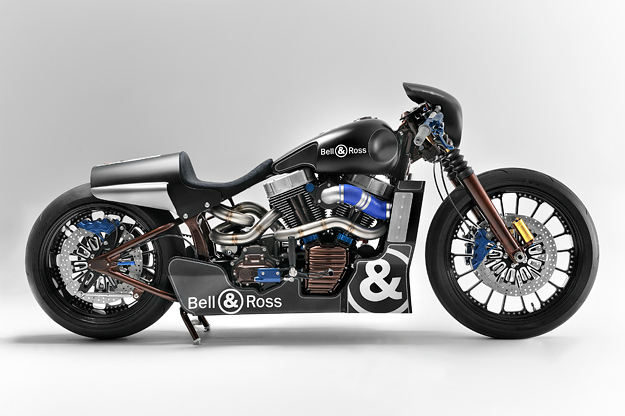 It’s called the Bell & Ross Nascafe Racer, and a couple of days ago it won the AMD Modified class at the Dublin International Motorcycle Show. 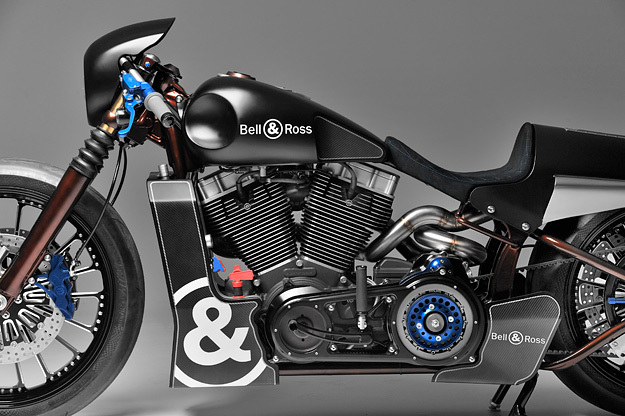 The Nascafe Racer is based on a Harley-Davidson FXSTB Softail Nightrain, although you’d never guess. The motorcycle was stripped down to the last nut and bolt, and given an aggressively lowered front end and a 240mm rear tire, with huge braking rotors on both the front and rear. 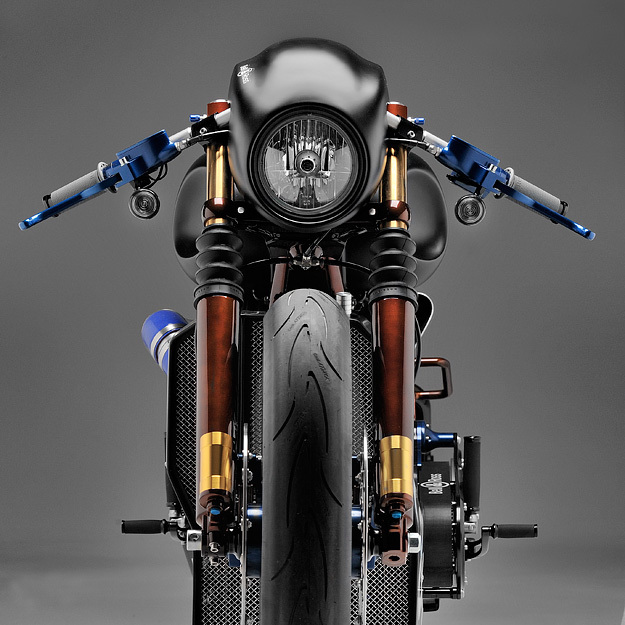 The handmade rear fender incorporates an exit for that extraordinary exhaust system, and a new tank was fabricated to fit around the engine lids of the anodized 1690cc motor. 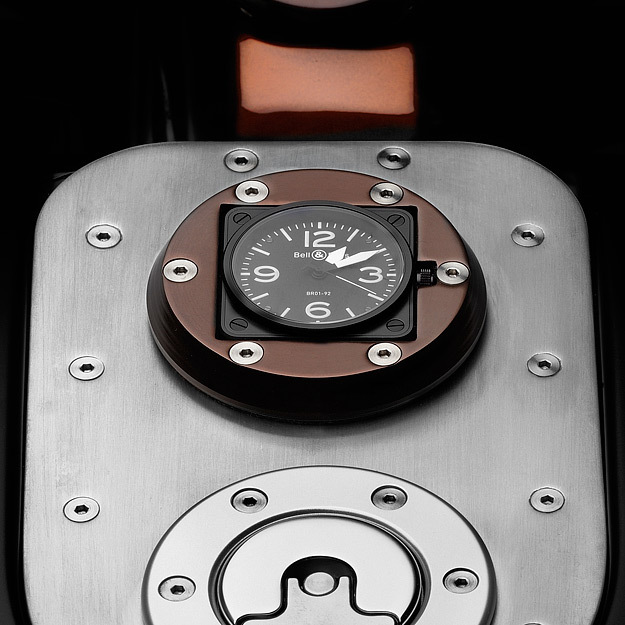 Embedded in the center console is a BR 01 Carbon timepiece provided by sponsors Bell & Ross; on the rest of the bike, a combination of anodized blue, carbon and matt black paint reflects the colors of the watch. The bike is heavy on parts from Performance Machine, including the swingarm, wheels and braking system. I never thought I’d feature two Milwaukee machines in a week, let alone two from the same builder, but Shaw’s creations definitely make the cut.